"Battle in Vain" by John DoeWe're big believers that there should be no specific purpose for a paper. Some watercolor papers are great for drawing. Some printmaking papers are widely used in invitations. Even Yupo - a synthetic paper - turns out to be great to watercolor. So we're always surprised that more artists haven't turned on to Plike. 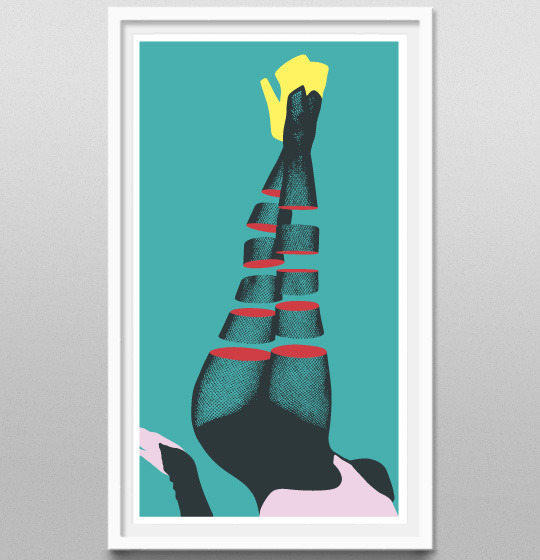 We saw this seven color screenprint from UK artist John Doe and thought we'd share. “When I Break Free…” is a seven-color, 20″x30″ print on Magnani Revere printmaking paper limited to 24 signed and numbered prints. Check out this print and others at his site. He's got an interesting bio as well, having spent parts of his life in Germany, Cambodia and Oklahoma. "I'm an optimist, but for whatever reason my work always feels somber. Maybe it's because beauty found in spite of sadness is the most precious kind. " A friend e-mailed us photos of these two new prints from Dellarious. "Kodak" is a five color screenprint on Stonehenge White 250gsm. Edition of 12; available in two variants. LA's BLK/MRKT has been putting out screenprinted editions on Stonehenge for a while now, working with dozens of artists. Without a doubt, worth a look.